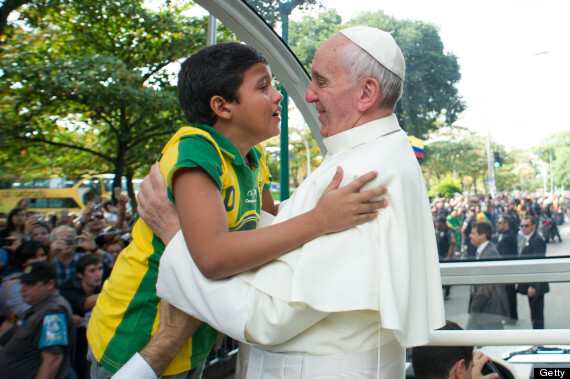 The story of Zacchaeus and our Lord Jesus Christ has some ponderable semblances with the encounter between Pope Francis and nine year old Nathan De Brito. Both Zacchaeus and Nathan faced an obstacle to their target and that is the crowd. Both of them did not give up as they used various methods to get to their respective targets and both of them succeeded. On the other hand their respective targets appreciated their efforts: Zacchaeus was assured: “TODAY salvation has come to this house” and Nathan was told “As for TODAY your vocation is set”. We can appropriately name today “Zacchaeus Sunday”. This is largely because all the readings talk about divine orchestrated renewal and salvation which are exemplified in the story of Zacchaeus’ encounter with our Lord Jesus Christ. To be thorough in our reflection, it will be pertinent to examine the gospel periscope very closely. The narration in the Gospel Reading (Luke 19:1-10) tells us about the journey of our Lord Jesus Christ to Jerusalem; a journey that started from chapter 9. During this passage through Jericho with a great crowd following, a short wealthy chief tax collector named Zacchaeus made an appearance. The name “Zacchaeus” is Hebrew by origin and means “clean” or “pure”. We are aware of the fact that name is of great importance in the bible. Here the name points to his destiny not what he was at the time. God is more interested in what He wants us to become not what we are at the moment! Zacchaeus must have heard so much about our Lord Jesus Christ who could at that time qualify as a celebrity of a religious kind. The great crowd following him was enough to make headlines about him. He must also have heard that one of his colleagues Levi by name (Matt.9:9-13) had left the lucrative business to join the revolutionary teacher. With all these, he came out to have a physical view of Jesus Christ; he was curious to see and access Jesus Christ with the privilege of his passing by his location; no longer basing on hearsay. Zacchaeus’ desire was hindered by two things his height and the crowd. Being a short man he was unable to have a comfortable view of Jesus Christ. Significantly he was not discouraged as he ran ahead of the crowd to a Sycamore tree just on the way he imagined Jesus was going to pass. Sycamore trees are known to be squatty in shape, easy to climb and comfortable to sit on. Zacchaeus by climbing the Sycamore tree, dropped his status and position; all in an effort to see Jesus Christ. It is like a senior director in our contemporary revenue office making such a humbling effort to see any of our contemporary religious figures. What Zacchaeus did could be connected only with children and it was fitting as our Lord would say that we have to become like little children to inherit the kingdom of heaven. When our Lord Jesus Christ came to the Sycamore tree, he did not pass; he stopped, looked up to where Zacchaeus was sitting and perhaps admired his unrelenting enthusiasm. With a passionate voice he said to him “Zacchaeus, make haste come down; for I must stay at your house today”. We can only imagine what Zacchaeus felt at this point. He only wanted to catch a glimpse of our Lord Jesus Christ but here our Lord went in search of him and not only did he find him, he also called him by name. He wanted to see Jesus Christ passing by but our Lord desired to dine and stay in his house. It is important to note that this is the only place that Jesus Christ invited himself to someone’s house. At this point the journey to Jerusalem was put on hold because of Zacchaeus. Plans changed because someone needed to be renewed and saved. 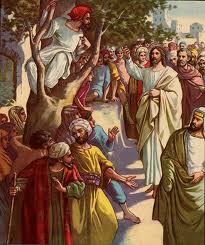 Zacchaeus hurried down and took our Lord Jesus Christ to his house. There were “righteous people” he could have gone to tarry with: the Chief Priest, Scribes, Pharisees, Sadducees etc. But he chose the tax collector. Notably tax collectors were regarded as sinners because they extorted so much money from the people. Now as a chief tax collector, Zacchaeus qualified as a Chief Sinner. By way of application we shall be dwelling more on three very important things in the entire story: the Crowd, Zacchaeus’ height and the Sycamore tree. If we go through the whole length of Luke’s gospel we shall be encountering crowd as a character. Crowd shows an anonymous group without solid direction. In most places in the gospel the crowd constituted a nuisance. The crowd could also stand for obstacle and confusion. The woman with the issue of blood had to contend with the crowd (Luke 8:44), the blind beggar too had a rough time with the crowd when he was calling on Jesus Son of David to have pity on him (Luke 18:39). From the narrative we discover that the crowd was the wall separating Zacchaeus from Jesus Christ. Sometimes in our lives we encounter so many sets of crowd. They could be in form of family issues, they could come from our businesses, and they could be in form of friends, habits and the choices we make in life. Anything that stops you from a genuine goal is a crowd! Next on line is Zacchaeus’ height. We are told that he was a short man. Perhaps he was indeed very short that it was a hell of problem for him to see through the crowd. In fact it could be said that his height made it easy for the crowd to block him entirely. There is another way of seeing this shortness; from the spiritual point of view. It could thus be said that Zacchaeus’ sinful activities as a tax collector made him to suffer spiritual dwarfism. The life of sin and disobedience to God brings us down to the extent that we become unable to see God very clearly and to be seen by him. In this situation one should not give up and say since I can’t see the case is closed. There is need to make effort. This brings us to the Sycamore tree. The Sycamore tree is very important in the entire story. In fact without the Sycamore tree the story would have ended with Zacchaeus getting frustrated and going back to his office. But the Sycamore tree brought the story to a happy ending. The Sycamore tree at the time of Jesus was a very important type of tree that served as shade, beautification and other things like what Zacchaeus used it to accomplish. It thus represents a place of succour, it could in this context be called a tree of faith, a tree of hope, a tree of divine assistance and a tree of salvation. With the Sycamore tree Zacchaeus became taller to the extent that he could be recognized by our Lord Jesus Christ. In fact the Sycamore tree helped him to rise above the crowd as well as above all the obstacles on his way. The Sycamore tree in some ways reflects the cross of Calvary. As a Sycamore tree was the saving grace of Zacchaeus, the cross of Calvary determined our eternal salvation. Without the Sycamore tree Zacchaeus could not have met our Lord. Like Zacchaeus most of us have become dwarfs, short men and women, not physically but spiritually. Our spiritual dwarfism makes us incapable of seeing and encountering God in a personal way. Our spiritual dwarfism makes it possible for the crowd to suppression and oppression us, and the crowd of obstacle to block us. Are you still going to stay there? Why not start running to the Sycamore tree from where you can see well and make that encounter with Jesus Christ. If Nathan De Brito had remained at the back of the crowd on that street in Rio De Janeiro, he would not have been able to express his desire to the Roman Pontiff, he would not have received that passionate hug and the legendry oracle that his vocation is set. It is all about making use of the opportunity we have NOW not tomorrow or in some other future time. Many people will actually go to hell not because they planned to but on account of failing to make use of the opportunity that presents itself like in the case of Zacchaeus. Just before we call it a day, it will be quite instructive to examine the attitude of our Lord Jesus Christ to the man publicly known as a sinner. Our Lord had earlier disclosed in the gospel of Luke (5:32) that he did not come to call the righteous but sinners. He furthermore disclosed to all that there will rejoicing in heaven over one sinner that repented than over ninety-nine others that are righteous and needless of repentance. For many of us today in our religious segregation, Zacchaeus does not worth the trouble of pausing the journey. Our Lord did not judge him, he rather saw in him an inner longing for God; a gap that needed God to fill. If our Lord had ignored Zacchaeus his conversion would not have been effected. We still meet a lot of “Zacchaeus’” at various points in our lives do we simply pass judgement on them and move on or do we stop and undertake a brief evangelical touch. Notably our Lord did not preach to Zacchaeus; only his loving and non-judgemental presence changed his life. You can become Jesus Christ to some Zacchaeus today! As you launch into a new week be aware of the fact that there may be crowd on your way but do not be discouraged. Rather than back off run ahead of the crowd and be assured of divine provision in your mission as you will see a Sycamore tree down the road. Drop your status, ranks and positions like Zacchaeus and do that climbing as that will be where the Lord will encounter you and have you renewed and rejuvenated. A trial will take you to the next level.